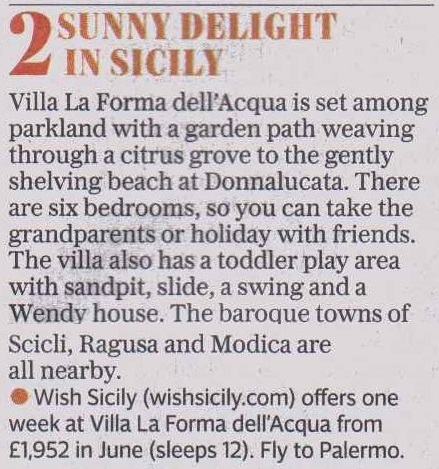 Thanks to the Daily Telegraph for including two of our villas in Sicily in their round-up of 75 Perfect Family Escapes, the first in a Telegraph series of expert travel guides for 2018. With ideas as diverse as Costa Rica to Umbria and the Dordogne to Valencia, we were thrilled to be in such great company! First up was a selection of best holidays for Babies and Toddlers. Villa Forma dell’Acqua is a six-bedroom stylish Sicilian villa that is ideal for a big gathering of family or friends. Together with a fabulous pool, the villa has a toddler play area with a sandpit, slide, swing and Wendy house – or you can stroll down to the beach at Donnalucata. Situated close to the baroque towns of Scicli, Ragusa and Modica, the villa is well-placed for exploring south east Sicily. 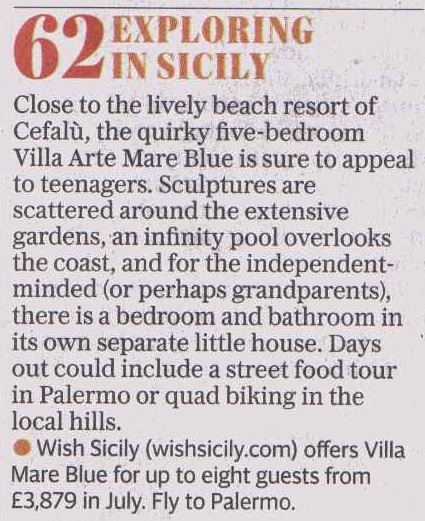 Included in the Telegraph’s recommendations for holidays for families with teenagers, Villa Arte Mare Blue ticks all the boxes. The infinity pool is guaranteed to be a hit with all ages but there is also a billiard room and, the ideal solution for independently-minded teenagers, an external annex which houses a bedroom and bathroom. Extensive gardens are dotted with quirky sculptures and the outdoor dining terrace has a covered outdoor kitchen and wood-burning pizza oven. Pop across to Palermo for a street food tour or venture into the hills surrounding Cefalù for a spot of quad biking. For more ideas on family-friendly villas and things to do in Sicily with the kids, visit Sicily with kids. When is the right time to book my holiday in Sicily?